Lucy, many years ago, enjoying her favorite room at Grandma’s house, the sun room. Update: As of 6:10pm cst, our dear sweet Lucy is no longer with us. The damage to her spine and ribs was more severe than initially thought. The cancer developed so quickly and aggressively that is was just a matter of time. So after numerous conversations with her oncologist, internal medicine specialist, and primary vet the decision was made this afternoon to put her down. We all agreed that we did everything we could, and that the idea of trying to keep up quality of life would be nearly impossible. Lucy, by this afternoon had no use of her back legs left, her spine and ribs could be easily fractured from even a gentle fall, and she had a look in her eyes (for the first time) that she was over it. I’m really still in shock at how quickly this happened, and the severity. I’m at a bit of a loss. She was a truly great pup and will be dearly missed. Thanks to all for the condolences, words of support, etc. In December ‘18 and January ‘19 we noticed that our 12 year old Boston, Lucy, was losing a little weight. We took her to the vet mid January, they ran some basic tests but everything came back ordinary, so she went on some basic anti-nausea meds. Then the usually strong appetite slowly started decreasing. By end of January the appetite was down to her only eating half of what she normally would, and she had lost 3-4 pounds. Not necessarily alarming, but obviously enough to warrant another vet visit, some tests/imaging, and a follow up visit. We were referred to an internal medicine specialist. After the initial tests came back, again, mostly normal, the game plan was to continue with the meds, now with a weekly B12 injection, and continue to monitor. Well, after two weeks the appetite had lessened, some apparent weakness was displayed, and she was losing 1 pound a week. We took her the Emergency Vet (same overall practice at which the Internal Med Specialist works) so that she could be evaluated and seen immediately. The next day she had exploratory surgery based on a suspicion of some kind of bowel disease. While in there they found a small tumor on the exterior of her stomach. Results came back a few days later, she was diagnosed with Irritable Bowel Disease and they had removed the entire tumor and it had not metastasized. All further tests came back clean and we began the difficult process of finding the drug cocktail that works for her IBD. Well, after the surgery she seemed a little unstable, wobbly even, at times on her back legs, but since all further tests came back clear, we all chalked it up to senior dog, major surgery, not a lot of food intake, and muscle loss. She’d get better over time. She didn’t. Further ultrasounds/imaging and blood work continued to come back clear but the weight was not stabilizing and the occasional weakness in the back legs was getting worse. Another trip to the ER yesterday. The first thought was perhaps she slipped a disc or some other, more common orthopedic issue unrelated to the others. However, this time, a large abnormality was visible on the spine, affecting some vertebrate and ribs and ultimately the back legs. They took some further imaging, some cell samples, and sent us home with a harness to use to help her potty and instructions to keep her immobile as she now has very limited use of the back legs. We got the call from the Dr today and it turns out it’s a carcinoma, unrelated to her IBD or stomach tumor, that most likely started in the lungs. It’s inoperable and fatal. So for now the plan is pain management and quality of life. We will get further test results in the next few days that will help determine the course of that treatment. We could opt to put her through chemo and radiation, but we feel like it’s selfish to do so on our part given the full picture. It’s particularly difficult because mentally, she’s all there. Physically, she’s just not, and it’s only going to get worse. We all know when we get pets that this is inevitable. It doesn’t make it any easier though. My wife adopted her at a few months old back in 2006. I first met her when she was 3 when we started dating in 2009. 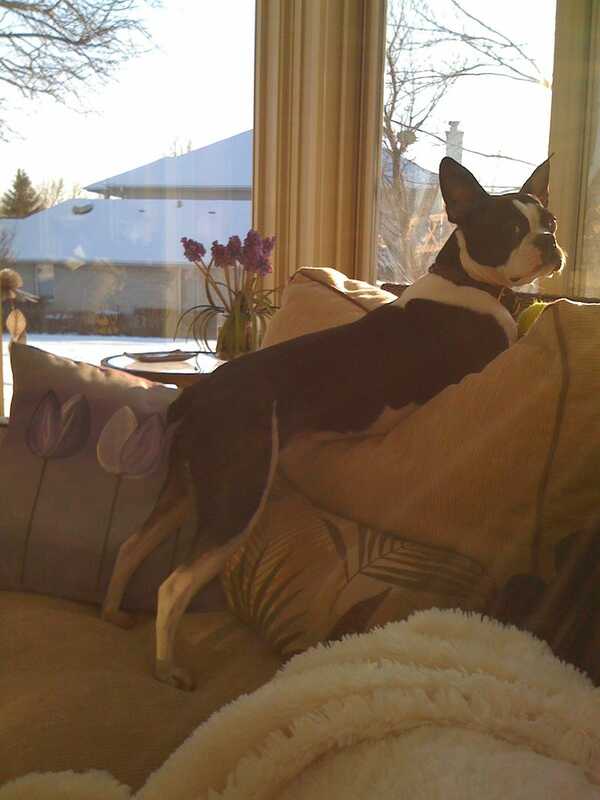 When I moved to Chicago in 2011, and moved in with my now wife, Lucy became just as much my dog as hers (and my Boston, Estelle, became just as much hers as mine). This is going to be particularly hard on our 2.5 year old Tuxie, Bowie, who thinks she is a Boston as well, and has a particular fondness for Lucy. Lucy’s 13th b’day is 4/22/19 and she has a b’day tradition of peeing all over flowers (don’t ask, it’s pretty much exactly what it sounds like). I fear that this year, we will be the ones peeing on the flowers in her honor. Lucy and one of her only big dog friends, Wrigley. Lucy got in my suitcase while I was packing back when Mrs. Humpkins and I were long distance. I think she wanted me to stay. When she was a younger pup, Lucy would randomly jump onto counters on her own. Lucy and Estelle having one of their cuddle sessions. Lucy and Bowie (the Boston Purrier) having one of their many cuddle sessions.